After a long day of traveling, I crawled into bed and worked on my laptop for a bit while Maile dropped immediately into a deep sleep. We had gotten up at 4am, left NC at 5:30. Our alternator in the Suburban went out at 8am, so we waited while that was fixed, ate breakfast at a neighboring diner, and tried not to think about how much it was going to cost. Right before Christmas. After finally getting home nearly 12 hours after we left, unpacking, grocery shopping, feeding the kids, getting them ready for school, and trying to keep everyone from trashing the joint in case we had another showing come up, we arrived at the end of the day. I read a little Conroy until my eyelids got heavy, closed the book, and that’s when the panic hit. Who knows where these things come from? Who knows what strange combination of synapses fire to send you down the path of worry, melancholy, or homesickness? How can we scientifically explain this experience of being human? 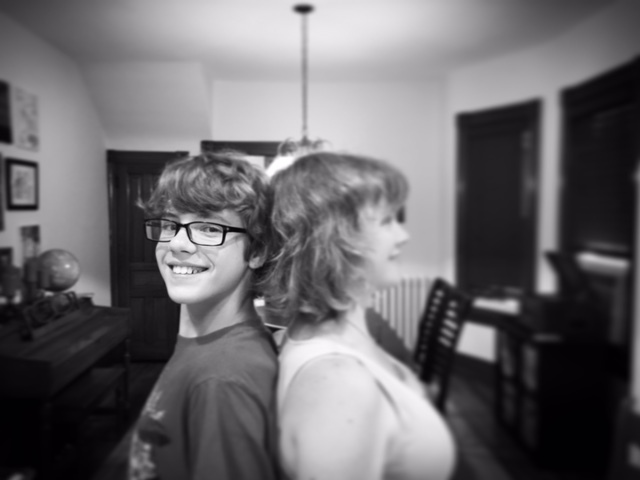 Suddenly, I realized my fourteen-year-old son would be leaving the house in less than five years. I know how fast five years can go. I thought of his easy-going personality, his constant desire to make us laugh, his never-ending tales of Minecraft or football or the latest book he’s been reading. And I thought about that not being in my life. And I panicked. Have I been a good enough dad? Have I done enough special things with him? Am I giving him the tools he needs to be a good human? It was a visceral sensation in my gut. I glanced over at Maile. She was asleep, the covers pulled up to her eyeballs, dead to the world. I slid out of bed. I decided I’d go to his room and hang out, sit on his floor as I sometimes do and just listen. He loves that. He can talk and talk, and we rarely have one-one-one time in this house of eight. I walked down the hall to his room, expecting to find him reading a book or squeaking out some last-minute homework. I peeked into the room. He was asleep, a book beside him on his bed. I guess it had been a long day for him, too. I stared down at his face. I pulled the covers up. I put his book on the shelf and my hand stayed on it for a moment as I looked at him again, remembering the smile he had when he was a baby. The house was quiet, and I followed the quiet downstairs, turned out the lights our daughter always leaves on after she showers. I double-checked the locks, hit the hall light, and slipped back into bed beside Maile. These years? They’re actually minutes. Seconds. I blink, and here I am, 40 years old. This is it. This is life. I love ur blogs and this one hit home. My children r grown & close to ur age. They each have two children and 3 of them have become young adults. Not only do I still worry about my children and the decisions they make now I also worry about my grandchildren. My grandsons recently moved in with me & now I feel like I am reliving 25 yrs ago. I thank our Heavenly Father that they r good young men but still need a lot of direction in life. I pray that I am able to guide them and let them learn from their own mistakes.You and Maile are amazing people and with God’s Grace I can guide my grandsons as u do ur children. As a parent I made so many mistakes that I can not undo & I don’t want to do the same with my grandsons. Blessings to u and ur family. Let me know if I can help with ur next move. MIss u guys. I love you, Theda. Thanks for your friendship. Beautiful post, Shawn. I’m in a countdown to when our youngest daughter moves out of the house. Dec. 18th is the big day. Such a bag of mixed emotions. Sad for what I’ll lose, all those happy, laughing times together every single day. Excited for her that she’s going to be independent, on her own, living out God’s plan for her next phase of life. (Please let her keep following You, God!) Excited for my husband and I to have some years to ourselves for the first time ever, since I already had 2 kids when we married. Life is so fast and sometimes unbearable slow, then you blink and the kids are grown. It’s still beautiful then, too, I’ve learned, as I’ve launched our first two kids over ten years ago. We still get to see our kids often and hear their laughter and enjoy their good humor. And now we get to enjoy the grandkids too (eight of them, all belonging to our oldest daughter! ), which is an added blessing. Hang in there. More blessings await you as your kids grow up, leave, and then choose to keep you in their lives because of all the years you’ve invested into theirs. It’s amazingly rich! I appreciate your encouraging words, Linda. Thank you. I trust you were a good dad! There is a time we need to leave the results with God. Treasure the next five years. I was 40 in 1988! My youngest grandson is where your son is now. God wants us to do our best, and he will do the rest! I trust you will feel God’s presence during the next months of transition. I’m certainly doing my best! Thanks, Marland. Look at it from the other vantage. You still have four years to be actively involved with him. Make the most of it.You’ll both cherish the memories made over the next 4 yrs for the rest of your lives.